Villa "Princessa" is situated right next to the main street of the village of Krapets. At close proximity there are some shops and snack-bars. The owner of the villa offers to his guests 3 bedrooms with double and single bad with 2 common bathrooms. The guests of the villa may enjoy the fully equiped kitchen (incl. coffee machine and microwave oven) and spacious dining room with satellite TV. There is also wireless Internet all over the place. Next to the house there is also a big BBQ area, which could accomodate up to 12 people. There are also 2 parking places for the guests. 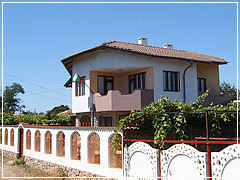 The Price for the whole villa is 120 Bulgarian leva (60 Euro) per day. For more information and reservations call Irina at +359 887 560 232 or Georgi at +359 896 192317 or send us e-mail to ira_koleva@abv.bg. Copyright © Krapets.com 2011 All Rights reserved.